The Dickey Center for International Understanding and Rockefeller Center for Public Policy, founded in 1982 and 1983 respectively, are both young in the College’s storied timeline. Even down to their close launch dates, the two centers seem like they are born out of a similar instinct — an enthusiastic desire to bridge classroom learning with hands-on, policy-focused work. Even Rocky associate director for curricular and research programs Ronald Shaiko notes that the students who participate in functions at Rocky share commonalities with those at Dickey. “Are they similar kinds of students with similar kinds of interests? Yes,” Shaiko said. Dartmouth has 4,000 undergraduate students — but there are two centers with the mission of fostering policy learning and leadership. Huh? Sydney Walter ’18, a student in the course, said she signed up for the course both out of interest in the minor and as a First-Year Fellows prerequisite. Many other students, including your faithful correspondent at one time in his life, want to spend a summer interning in Washington, D.C. at Rocky-coordinated positions. Like Rocky, the Dickey Center provides student internship funding, hosts prestigious guest speakers, coordinates an array of courses and supervises a minor. Dickey student programming assistant Freya Jamison ’17 said that by discussing subjects as broad as policy or global events, there are inevitably some overlaps between both centers. Rocky director Andrew Samwick also described the relationship between Rocky and Dickey as very similar relative to the various student activities available at Dartmouth. With regard to programming, the Centers manage to distinguish themselves from one another. Sort of. The Rockefeller Global Leadership Program seeks to foster international leadership competencies and intercultural understanding — values that closely intersect with those touted by Dickey. Jamison noted, however, that the centers take advantage of such overlap by collaborating on some projects. In the Global Leadership Program, Dickey staff members are often featured as speakers. “It makes a lot of sense to me that the place where you would go to find global health programming is different from the place where you would go to learn about congressional internships,” Jamison said. Rocky program coordinator Robin Frye emphasized a focus on leadership development as a huge part of Rocky’s co-curricular niche — a goal not surprisingly reflected in programs like the aforementioned Rockefeller Leadership Fellows and Dartmouth Leadership Attitudes and Behaviors. The matriculating class witnesses Dickey programming in other ways. This year, 103 first-year students — including all freshmen in the Global Village residential community — participated in the Great Issues Scholars program. It’s time for me to apply the vast reservoir of knowledge I received in Econ 1 (and 24 — I know, I’m a freaking superstar). These internship stipends, guest speaker bills and activity costs add up quickly. Both Samwick and Dickey director Dan Benjamin pointed toward alumni support as a major asset — fiscally and beyond — in their attempts to subsidize student internships and activities. Shaiko said Dickey and Rocky have different methods of fundraising. It is only at the College advancement and development level, he said, where competing priorities would affect funding. Benjamin has a point that Dartmouth alums have been generous in the past. In 2009, Rocky received a $5.6 million donation from Fritz Corrigan ’64 and his family. Recently, Tom Russo ’77 and his wife Gina Russo ’77 made a large donation to Dickey that allowed the Center to expand its Great Issues Scholars program. For Alex Mahler-Haug ’11, who called Rocky a “central” aspect of her Dartmouth experience, an appreciation for the Center naturally extended beyond her years at the College. Mahler-Haug now participates in Rocky’s Alumni Mentoring Program, which matches young alumni with recent graduates, and has also made financial contributions to Rocky. She does not perceive many tensions between departments over alumni giving. “It’s not that I would immediately dismiss any center asking me for money, but I’d pretty much always say ‘yes’ to the things I participated in because those are the activities that made my Dartmouth experience,” she said. Both Rocky and Dickey also have Boards of Visitors, some of whom are also alumni donors, that advise the future direction of each center. Like Chang, Dickey board member Raffiq Nathoo ’87 said a glance at recent headlines could show that “the big issues are international issues.” At Dartmouth, Nathoo focused on international relations within his government major and studied abroad twice. “It’s part of who I am,” he said, speaking about the culmination of those experiences. “I view Dartmouth as the college and the great institution that it is — first as an institution, as a community. I don’t think of it as different departments and components and entities in the community,” Nathoo said, echoing Mahler-Haug’s sentiments of non-competition over alumni giving. 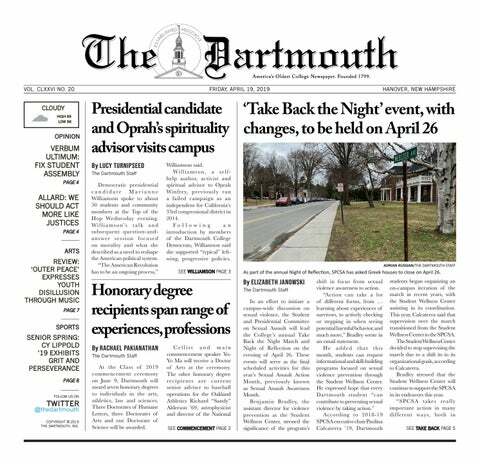 If you buy the rhetoric coming out of McNutt, Dartmouth is made up of many diverse demographics, with policy kids just one group among a sea of athletes, artists and a capella stars. So how can the policy-minded students who make up only a portion of each class support two entirely independent centers? Shaiko said that Rocky’s curricular aspect uniquely stands as the only interdisciplinary program that reaches such a large cross-section of students. He said about 300 to 400 students take at least one public policy class each year. Meanwhile in the 2013-14 academic year, Dickey funded 97 internship and research applications, selected 29 War and Peace Fellows, hosted 29 public events and oversaw six clubs. Shaiko does not view acquiring student participation as a competition. Still, Shaiko did note that students can only take on a finite number of commitments, but he said that Rocky does not control how students allocate their time. Speaking more generally about potential competition for donors and student interest, Samwick said he does not believe the centers are competing in a zero-sum game. Benjamin said that every year a “core of students” is deeply involved in both Rocky and Dickey, but that the interaction between the two centers is cooperative rather than competitive. “I think the bigger challenge is finding time in the schedule and turning out students who are extremely busy,” he said. Kevin Zhang ’17 is one of those busy, perhaps “core” students. He has been a Dickey Great Issues Scholar, a Rocky First-Year Fellow, participates in the Dickey-sponsored World Outlook journal and intends to pursue a public policy minor through Rocky. Like Jamison, he thinks the two centers have distinguishable academic niches. Though he has not seen any patterns in the general “type” of student interested in either center, Zhang said Rocky programming seems to attract students with stronger and more deeply charged passions. “Maybe [Rocky attracts passionate students] because Rocky events are typically political in nature and tend to draw far more passionate opinions then, say, water scarcity in Sub-Saharan Africa, which almost everyone can agree is a bad thing,” Zhang said.